Colton was born on June 30, 2009. 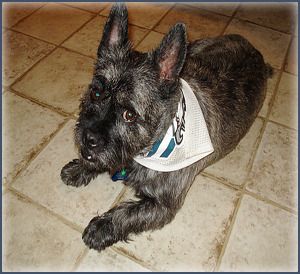 His mommy was a black Pug and his daddy was a white West Highland Terrier (or so we were told). This combination has given Colton a unique salt & pepper look. Most work days you can find Colton in our showroom snoozing in the middle of the floor or sitting in the front window watching over Locust Street. If he’s not there he is either out for a walk, or visiting the bank, where he always gets a tasty treat. We welcome you to stop in and visit with Colton – his bark says HELLO!